Learn how to use SQL Server 2005 Reporting Services to build a table report and matrix report without the use of the Report Wizard, and get up to speed on two new report types. 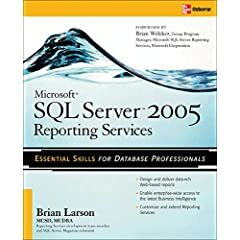 From learning about new SQL Server 2005 Reporting Services report types to building reports without the use of the Report Wizard, this collection of book excerpts from Brian Larson's Microsoft SQL Server 2005 Reporting Services 2005 will get you started. It also covers basic report items, including line control, text box control and rectangle control. Microsoft's Reporting Services product is a vital part of the SQL Server 2005 business intelligence platform, but it works with virtually any data source. This hands-on guide explains how to transform data into insightful and interactive Web-based reports using Microsoft SQL Server 2005 Reporting Services. With coverage of everything from installation to administration, the book demonstrates how to use this powerful server-based reporting solution to improve business decision-making and facilitate company-wide -- even worldwide -- communication.